I just read my goals for 2010 and I’m pretty psyched that I managed to get two things done: the cob oven built and the property purchased. I had actually forgotten about my pledge to buy some property for my high density orchard dream in 2010–who could have guessed it would have been our squat lot? I noticed, too, that I didn’t do a lot of the things on my list of things to do. Like tan all those rabbit hides in the freezer. Like to not grow vegetables during the hot summer months. I also didn’t go foraging much, even though people were nice and offered to show me their secret spots, etc. And I also didn’t get serious about my finances (again). That’s life, though, you do what you can. In that spirit, here’s my look back on 2010, and plans for 2011. I ended up increasing my rabbit flock, what with the San Lorenzo farm and all. Now they’re at my place, in really nice Bass cages, and I’m so happy how they are thriving and reproducing. The dairy goats were a disappointment on one hand because they kidded all males. On the up side, Ginger has a really nice udder for a first freshener. I’m hoping it’ll get huge after her second kidding. My goal is more milk production, and I’ve realized that I just have to grow my own champs. Bebe is giving up six cups of milk per milking, a new record for her, and a tripling of her intial production when I first bought her almost three years ago. Yay Bebe!! Photo by Morgen Van Vorst. The bees gave quite a few gallons of honey this year, enough that I could sell some of it at my pop up farmstand. My split didn’t work, I realize now because I didn’t put the new hive far enough away from the old one. Duh. Good to make dumb mistakes, in order to learn. Next year with the animals, I’m looking forward to my Muscovy ducks successfully hatching out babies (they sat on a clutch of eggs for two months, nothing hatched though there were embryos in there). I’d like to add one more milker to the farm, most likely by birth. And one more beehive at the farm. My triamble squash were small this year. The clear winner in terms of production was the trombocino/rampicante zucchini. Not only did I get million little zukes, I also let a few of them go and they made gorgeous, sort of phallic winter squash. Great color, and delicious eating. I’ll def grow this squash again (but only one). I learned to love rapini, which is a great weed, and turned others onto it at my farmstand. I also learned how to cook borage leaves. The garden definitely thrived with the new French Intensive Bed layout. I also learned how to use floating row cover and shade cloth–two essential tools for the new stupid weather conditions caused by global climate change. I got a little better about starting enough seedlings on prop tables so I can do on-going plantings throughout the year. Next year’s garden goals are to do more continuous production, higher sales, better staking and garden infrastructure, espaliered fruit tree fence, build a greenhouse, get the compost under control, and wack back all that ugly stuff that I don’t like. Oh–and slowly pick axe the concrete, one bed at a time. I guess I can use the urbanite to build the walls for the outdoor kitchen? Really happy to finish, with Willow Rosenthal, the Essential Urban Farmer. It’s due out in 2012. Also glad to be working on my next book, Gone Feral, for the next year. My mom’s a teacher, I never thought I would be. But there I was, teaching animal husbandry classes at the BFO. 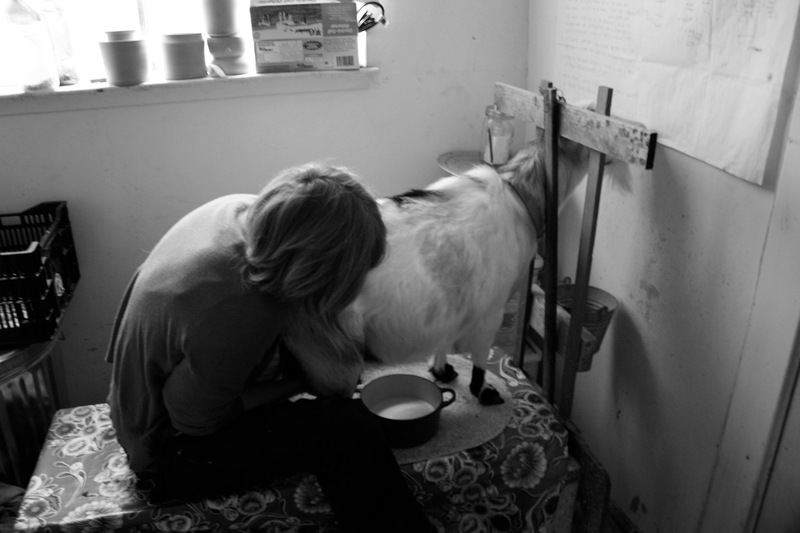 I’ll be teaching more in 2011, including cheesemaking, goat, rabbit, and chicken raising. See http://www.biofueloasis.com for a list. As I get the outdoor kitchen built, I’m looking forward to teaching hands-on classes at my place. I’m also hoping to have more kids come to the farm to learn about urban farming. Those are my highlights. What are your plans for the upcoming year? What was a success/lesson that you learned at your place? This entry was posted in bees, Biofuel Oasis, fruit trees, goats. Bookmark the permalink. Hey Novella – cograts on buying the squat lot! Such fantastic news! My big experiment this year was to raise a 3-sisters garden (Corn, beans & squash). It worked beautifully – the corn provided a growing trellis for the beans & the squash leaves kept the soil moist and weed free. My lesson learned would be NOT TO USE ZUCCHINI as the squash base. After weeks of zuchhini humus, zucchini soup, zucchini quesedillas, zucchini bread, zucchini pasta… I may never want to see another one, and I don’t think my friends will ever let me live it down! Next year I’ll use pumpkins! You are AMAZING! 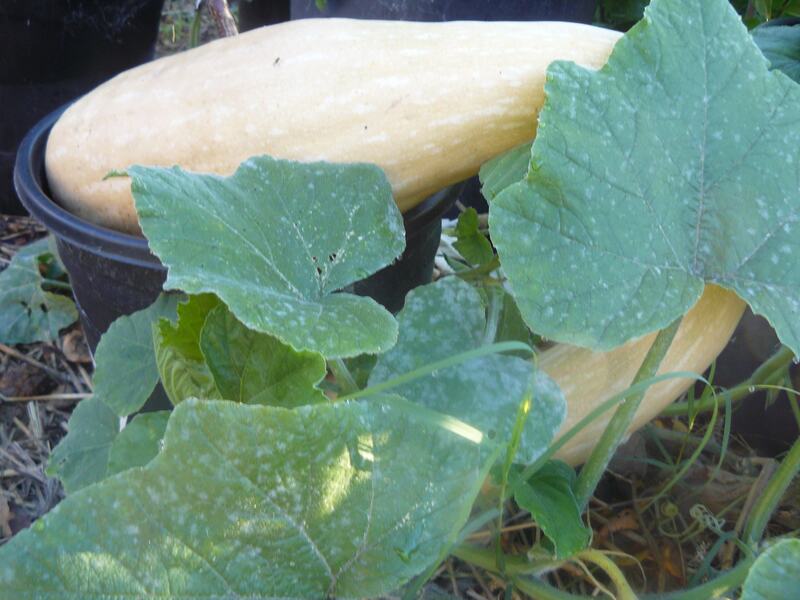 And my triamble squash were tiny this year, too. Only one decent sized one; the rest were equal to the size of two human fists. I think it was a small squash year. Mine were also tiny. My triamble plant was unceremoniously dug up by some critter, so I didn’t get any squash from it, but all my other winter squash were tiny and underperforming. May next year be better! Exciting about your books. Like super duper cool. Do you have a book designer? Let me know if you need one. We could talk hens, squash and book design. Man I’m glad to hear that the Triamble’s size was a problem for everybody. Mine took forever to make a fruit- way longer than the pumpkins. I figured it just didn’t like Oregon. I also did the three sisters thing, but there wasn’t enough fertility in the ground and my Country Gentleman corn lodged. I did get some ears off the Quickie hybrid, but the CC was pretty much a complete loss. So-so on the bean production, but I got sixteen pumpkins! Next year, I’m going to grow Sweet Meats, because they actually keep for months and get sweeter as they age, so they’re supposed to be better for pie. I am NOT growing tomatoes right next to asparagus again- what a jungle! Next year, I’m going to try to plant stuff so that it will be ready at the proper time, and not as soon as it can go in the ground. The cabbage for sauerkraut needs to go in muuuuch later than I planted it this year. Same for the parsnips. I hope I learned a lot this year- it seems like I did. I already have my bees ordered, and I hope I can add ducks and chickens next year as well. Really glad to hear that you have another book coming out- I so enjoyed Farm City. I didn’t start following your blog until about mid-year so I never saw your goals for this year. Reading them, we have much the same plan for this coming year, including raising Guinea hogs. Congrats on getting your bigger accomplishments from your list! Don’t pickaxe your concrete one bed at a time. Rent a gas-powered concrete saw or a electric or gas jackhammer and bust it all out in a day. Get over some friends too, you shouldn’t have a problem with that. Stack up all the urbanite in the corner until you’re ready to use it. why do it all at once? seems like the whole place will be destroyed and i don’t have time to do it all. it won’t take one day–i have to move all the beds that are on top of the concrete, then jackhammer. then i have an gynormous pile that goes where? i’m more like a turtle when it goes to work. but i want to get your insight! christine: hey!! def save the seeds from the biggest triamble (i did get one big one too). maureen: i wish i could hire a designer, but they do it all in-house. boo. rachel: sweet! let me know how the hogs go–where will you buy them? niki; ha ha, zukes are really crazy. i’m always surprised when people buy the damn things…. paula: i’ll be writing GF with you in mind! I guess that situation takes a little explaining: A little aquifer forms under the concrete, with no evaporation or weeds, so tomatoes can just expand their roots when they need water. The concrete also has enough thermal mass that foliage growing over it is protected from light frosts. Because the soil can’t be tilled, I try to encourage deep roots, especially ones with rhizobium-bearing nodules, to keep it open; the open patch of soil is relatively small, and has enough root space to keep it very thickly vegetated, so I never need to till that space either, which seems to provide a good soil ecosystem. I reckon the underside of it makes lime available, without overdoing it. Lastly, it’s reflective enough to add a little sunshine to the plants around it. All that, to say: you might consider using a diamond hole saw rather than a pickaxe, in some parts of your garden. You’ll save yourself a lot of mulching, weeding, and watering. I think it works better when some rainwater is directed into the planter hole over the course of the wet season. First, congrats on getting the lot! It is nice to know that you will be able to stay in the area. Also, I am planning on doing a split of our hive in the spring. How far do you think I should move the second hive? (Our yard is only so big!) Best of luck with all your plans! pamina: pretty far–like two miles, then bring them back once they’re established. or, instead of that, leave them about 10-20 feet apart but block the entrance almost entirely so they have to fly out and reorient themselves. a smart fella told me that one recently, i haven’t tried! I cannot wait until the Essential Urban Farmer is available. I have been so inspired by your trials and tribulations! My goals for 2010: plant a perennial veg (perhaps asparagus), find a paw-paw tree and try its fruit, and start or adopt a bee colony. Shred and freeze zukes, and use them all winter to make zuchinni latkes. I have friends who beg to come over for a latke meal. If you don’t have enough shredded zuke, add shredded parsnips or carrots or potatoes or yellow beets until you have enough. Congrats on the land! Yay! next year i hope to get some more writing published, and come out and visit you. Next year I swear I’ll get brave and start messing around with fermentation. You never cease to amaze me Novella. You’re my hero! Wishing you and Bill and a new year filled with joy, laughter, good health, and more urban farming adventures. This past summer was a huge disappointment in the gardens. The weather in the pacific northwest was cold and wet until July and nothing grew. Nothing! But, it fueled my fire to commit to a greenhouse this spring and to basically step it up out there. A cold frame, a hoop house, something that will offer a longer growing season. So here I am at the end of the calendar year, looking to finally have the year round growing cycles. I feel good about it. It’s all a journey and hopefully mine will have more vegetables from the backyard. I’m a new fan so I was relieved to come here right after reading your book and finding out that you get to buy the lot. Especially after just watching The Garden, which didn’t have as happy of an ending. Looking forward to following your new adventures as they unfold! I might just have to come on down for 2011 and take one of your classes (can always learn new things from another rabbit and goat farmer). Oh, I forgot to add my plans and what I learned! (Shows how tired I am today). Next year I would like to grow more food, less weeds. I would also like to settle on one variety of everything I like that grows well here, so that I can properly save seeds (last year was somewhat of a failure in that, I once more saved squash seeds and some painted mountain corn seeds, but little else). My rabbitry also needs expansion, and I would like to start selling more of their fiber (I raise angoras). I also want to cull more extensively (I only did half of what I said I was going to do this year), but select better juniors for the next generation. And lastly, I’m going to give it a go with two pygora or nigora goat does. I’ve been debating it for quite some time. I’ve had plenty of experience with bigger goats, and they are so much fun that I can’t not have them around any more. I figure, they are dual-purpose enough for me that I could rationalize using the space to house them. But first, I guess I need to get a better job!